Dissipation in generators appears as heat which must be removed. This heat appears in the armature conductors, field-winding conductors, stator core, rotor surface, and other structural elements of the machine. Cooling of armature and field conductors may be direct or indirect; the difference is direct contact of the cooling medium with the conductor or contact through electrical insulation. Alternating-current generators may be cooled by air, hydrogen, water, or (very infrequently) oil. In large machines, no matter what the cooling medium, heat is transferred to water in heat exchangers that are located within the machine case. Smaller machines are cooled by air. Recently, there has been a trend toward air-cooling larger machines. The upper limit in size for air-cooled machines is, as of this writing, about 350 MVA, and may increase further. The advantage of air cooling is simplicity. The disadvantage is machine size. Hydrogen has had wide application in cooling of larger generators. It has a high specific heat and thermal conductivity and low density, so it provides better heat transfer with lower windage losses than does air. Hydrogen also does not support oxidation, with some advantage to insulation systems. Cooling a generator with hydrogen requires additional systems to maintain hydrogen purity and to remove hydrogen from lubricating oil and shaft seals. Since the “explosive” range of hydrogen/ oxygen mixtures is about 5% to 75% hydrogen, if the purity of hydrogen is kept above about 95%, the cooling medium will be nonexplosive. Water is used in armature winding cooling in very large machines. Fans used in electric machines may be of either radial flow or axial flow, and a wide variety of cooling paths are used. Figures 7-22 and 7-23 show two possible schemes. by punching holes in the laminations. Radial passages are formed by spacers that hold the core packets apart. Radial passages might be about 1 cm in axial length with spacing of about 5 cm. In some cases, as shown in Fig. 7-22, axial and radial cooling passages are mixed in one machine. In some cases, the ventilating gas passes first radially inward and then radially outward. As with the stator core, rotor cooling takes on a variety of forms. In some cases cooling gas passes axially from the ends of the rotor and then exits through holes in the rotor surface into the air gap, and then passes through the stator core. In other cases, gas passes radially inward from the air gap, diagonally through the rotor, and then radially outward to the air gap. 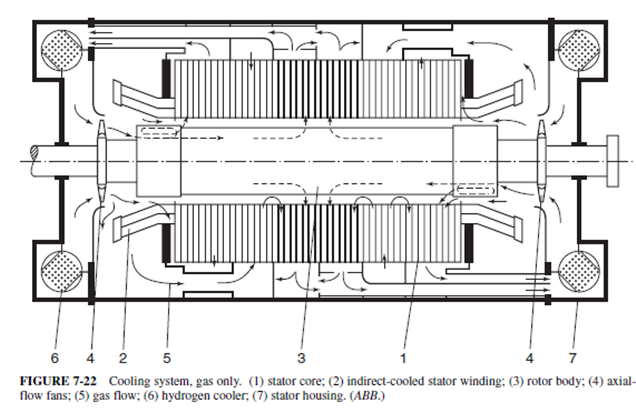 This scheme can be coordinated with cooling of the stator core. Direct cooling, the norm for rotor windings and widely used in stator windings, exposes the cooling medium directly to the conductors. 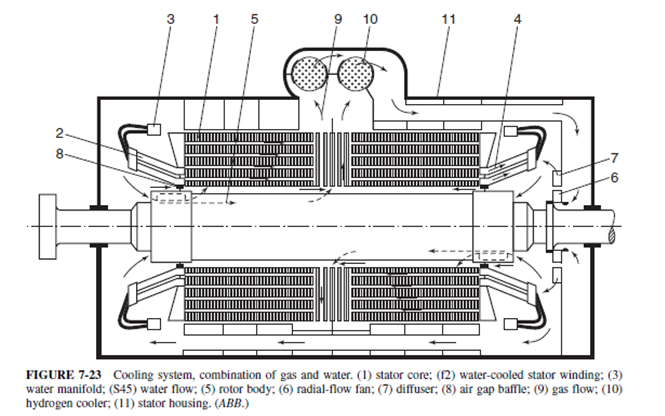 Figure 7-24 shows hydrogen and water directly cooled conductors for both stator and rotor. 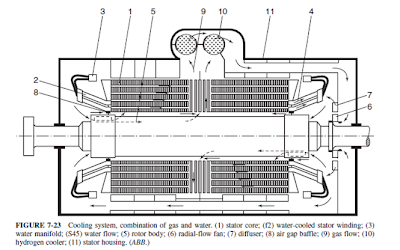 In a directly gas-cooled stator, relatively large passages are built into the conductor bar. The conductor strands are transposed around the gas passages. There is strand insulation between the conductor strands and gas passage (which is often made of stainless steel), but the gas is within the ground wall. In a directly gas-cooled rotor the gas flow may be radial, axial, or diagonal, or some combination of all three. 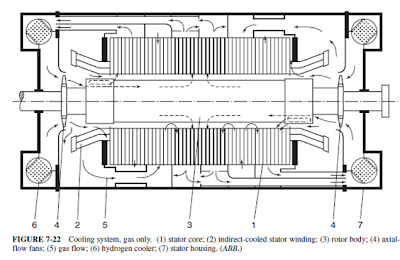 In a directly water-cooled stator winding, the water flow may be in direct contact with the conductors. In some cases some or all of the conducting strands are made of hollow copper tubing. In others, stainless-steel tubes are used. Typically, water flows through the machine only one or two axial passes before being returned to the cooler. 1. The water is maintained at very high purity so that it has low conductivity. 2. Water is carried to the armature conductors through specially made hoses, since the conductor bars are at high potential and the water header is at ground. 3. Generally, hydrogen pressure in the machine is maintained above water pressure so that any leak will be of hydrogen into the water system, rather than water into the electrical insulation. Water-cooled field windings are relatively rare, although many have been in highly reliable service for decades in some of the world’s most powerful nuclear turbine generators. Very Nice one - Thanks !! Please inform us if there are links and posts that we should remove. Thank you. MOSTECH 2099. Picture Window theme. Powered by Blogger.